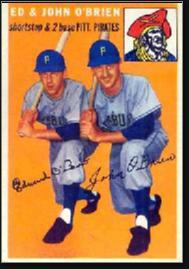 Edward Joseph O’Brien and John Thomas O’Brien were identical twin brothers born December 11, 1930 in South Amboy. Eddie and Johnny were superb athletes, excelling in basketball and baseball. The O’Brien twins were tough, tenacious and supremely coordinated. They stood 5'9" but played much bigger. The O’Briens got a few scholarship offers to play basketball, and accepted on from tiny Seattle University, a small catholic college in Washington State. There the duo rewrote the record books. In January of 1952, a charity basketball game was arranged between the Chieftans and the Harlem Globetrotters. Funds would go to the U.S. Olympic basektball team, which was headed to Helsinki that summer. The Globetrotters did their share of clowning back then, but they were also a repository of some of the top African-American hardwood talent. When they played serious ball—and in pro tournaments they did—the Globies took no prisoners. Johnny, who was leading the nation in scoring at that point, played the pivot position in place of the Chieftans’ bigger, slower center Bill Higlin. Eddie, manning the point, kept feeding his brother passes. Johnny muscled his way to the basket with hooks, scoops, layups and anything else he could think of. Goose Tatum—nine inches taller and one of the two or three highest-paid players in the game, simply could not contain Johnny. During one of the skirmishes in the paint, a stray elbow caught Johnny flush in the face and fractured his nose. Just before the halftime buzzer, Eddie canned a heave from halfcourt to give Seattle a 36–35 lead. The war resumed in the second half with Johnny on the bench, icing his nose and trying to control the bleeding. The Globetrotters stormed back to grab a 55–-54 lead. Johnny got back into the game and stemmed the tide. Slowly but surely, Seattle got its lead back up to 10. In the final minutes, the game was played at a frenzied pace. Seattle saw its lead whittled to 83–81, and the referee whistled a jump ball with 9 seconds to play. The Globetrotters called a timeout, forgetting that they none left. They were whistled for a technical foul and Johnny calmly nailed the free throw that iced the game, as there were no three-point shots in that era. It was his 43rd point. In one of the great upsets in the early history of basketball, Seattle beat the Globetrotters 84–81. Johnny would go on to score 1,051 points that season, making him the first player in NCAA history to reach the 1,000-point plateau. He and Eddie led the Chieftans to the NIT Tournament that spring, and the NCAA Tournament in 1953. It was the school’s first-ever NCAA Tournament appearance. Seattle beat Idaho State in the opening round, but fell to Washington, which went on to make the final four. Amazingly, it marked the first time the two schools had ever faced each other in a basketball game. The Twins combined for 3,970 points in three varsity seasons together—on paper, at least, this qualified them as pro prospects. However, the NBA was in its early years, and was no place for players the size of the O’Briens. Although both were drafted by the Milwaukee (now Atlanta) Hawks, they looked to the diamond for their future. Their baseball skills appealed to the Pittsburgh Pirates, who signed the twins to large bonuses after they graduated in 1953. The bonus rules of the day compelled the Pirates to keep Eddie and Johnny on the major-league roster, so they made their debuts that April—Johnny at second base and Eddie at short. They were the first twins to appear together for the same team, and at the time just the second brothers to man the keystone positions for the same ballclub. The most recent duo is Cal and Billy Ripken of the Baltimore orioles. Both brothers missed the 1954 campaign because of military service, but returned to Pittsburgh in 1955. Johnny batted .299 in 84 games and was one of the league’s better defensive second sackers. Eddie saw time in the outfield, where his strong arm enabled him to gun down nine runners. Following the 1956 season, the Pirates were allowed to send the O’Briens to the minors, which they did. Eddie saw action in four games with the big club in 1957 and 1958, and retired as a player. He hung around the game as a coach, and was immortalized in Jim Bouton’s Ball Four in 1970. Johnny was traded to the Cardinals and finished his playing career with the Braves. After his playing days, Johnny moved back to Seattle and worked for a while calling Seattle U. games on radio. His broadcast partner was Keith Jackson, who would go on to enjoy a legendary career behind the microphone. One night a fan handed Johnny a bag. It contained the ball from the Globetrotter victory, which had disappeared in the postgame bedlam. The fan wanted the O’Briens to have it. Eddie, who also worked for the university and consulted for the energy industry, passed away on February 21, 2014.